I feel like I have spent most of my adult life in search of the perfect productivity solution. I have tried lots of different things. Bullet journal-ling, Wunderlist, Trello, Asana, Google Tasks, Outlook, lists in random notebooks, lists on tiny super lose-able slips of paper. Nothing really works, although some have come closer to working than others. I wonder sometimes, if it’s me, the systems, or the fact that I seem to be searching for some perfect mindfulness/productivity thing, and really no one gets all of the things they need to do done. That maybe I should just live my life and be happy instead of constantly pursuing some elusive unreachable goal of perfect productivity. Anyway, I’m trying another to do list app. A friend posted on Facebook about Habitica, a to do list app that is built like a video game. I signed up and joined her party. 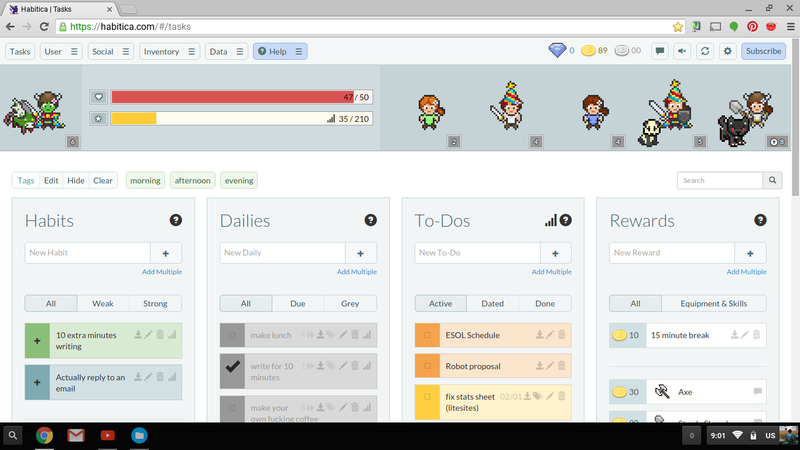 Habitica lets you set up habits, dailies (daily tasks) and a to do list. Whenever you check off one of your things, you get experience point, gold and silver coins. If you miss one of your dailies, you lose health points. At seeming random times, you can also get a drop of either an egg, hatching potion, or food when you check of an item. You use the hatching potion to hatch the eggs, and you can collect up to 90 pets. I have 6 pets, but so far my favorite is the Zombie Flying Pig. I’ll admit that I think my habits and dailies are probably too easy. But I’m absolutely terrible at replying to emails, and I really have been doing a decent job at bringing my coffee to work. I”m up to level 6! And I have pets! And a helm, and a sword! Oh good god I’m a giant dork. Whatever, it seems to be working, I just wrote for 10 minutes after all, so I can check that off for today. Maybe I’ll get lucky and a saddle will drop so I can ride my Zombie Flying Pig! Nope, oh well maybe next time.